In our blog posts we have already mentioned many times Rockit, the website centred around Italian emerging music. All the hipsters who follow the indie music scene in Italy know about it, but we feel that even more people should discover this resource as it truly is the leader when it comes to discovering great Italian music of all kinds. Rockit also organises the biggest summer festival for emerging Italian music, MIAMI, a 3-day event in Milan which is attended by about 15K people and where the frestyl crew has so far spotted some of its favorite bands, including the ones that came to NYC with us to play at frestyl’s showcase at the Northside festival last year (e.g., Serpenti, LE-LI). In addition, over the past few years Rockit has organised another event which I find really remarkable, a celebration of Italian music all around the country, called Maledetta Primavera. Basically every venue can take part in this event by inviting their favorite Italian bands to play and branding the concert as “Maledetta Primavera” (“Damn Spring”). This year’s edition of Maledetta Primavera, taking place on the 19th of March, has already seen over 100 venues subscribing to the event, and the number is growing every day. It’s a pretty simple and straight-forward format, but it contributes to creating a bigger awareness of the amount of Italian music currently circulating through live shows all around the country. Maledetta Primavera wants to give a voice to this growing phenomenon, allowing it to emerge from the limited space of small and medium local venues and making it become a more accessible and, at the same time, relevant, event. Rockit is telling us that we should have a day when we officially celebrate Italian music, but not the mainstream music that people usually hear on the national radio or see playing on MTV. In addition, this year Maledetta is trying to reach outside of Italy and demonstrate how the barriers that usually contain Italian music within the country are now being loosened up as many bands have already managed to reach an international audience and play shows abroad. So this year’s edition of the festival is supposed to include concerts in Slovenia, London and hopefully New York. In all this, frestyl has been called out by Rockit to help out with this “internationalization” project and we were very excited by the idea of working with them, not only because we respect them, but also because making Italian music more internationally known has been one of our missions since the beginning (see again our showcases in NYC). In addition, frestyl is lending a technical edge to the festival by presenting the entire program on Maledetta Primavera’s frestyl page and linking the hundreds of events to its Facebook and Twitter accounts. And finally, the Rockit guys were pretty excited to see all their events on frestyl’s iPhone app, and we have to say we’re psyched too. Going back to the music, Maledetta Primavera is first of all a local event in which people from different cities and villages can celebrate their favourite local (or not) bands. But also, the festival can become a great occasion for music fans to plan a daily trip around Italy driven by the desire to follow a specific band or the curiosity towards a specific type of Italian music. For instance, if you’re looking for some Italian singer-songwriters you could go to Livorno to see Le Luci della Centrale Elettrica playing at The Cage, or near Siena to see Paolo Benvegnù playing at Mattatoio, or finally to Milano to see our friend Davide Brace (whom we met and saw playing in New York) at Il Tornio. On the other hand, if you’re looking for more rock-oriented Italian bands you can go to Perugia and check out Verdena playing at Urban, or to Padova to see The Zen Circus at Pedro. Finally, if you’re looking for Italian bands with a more international sound, you could go to Macerata to see The Niro playing at Groove, to Salerno to see A Toys Orchestra at Ju Bamboo or finally to Ascoli Piceno to see our LE-LI at Brevevita. If you are or happen to be in Rome, we’ve already mentioned last week in our interview with Frigopop, that the second day of RomaPopFest, will take place in conjunction with Maledetta Primavera. Spread out over two venues, Mads and Le Mura, various bands including Young Wrists and I Quartieri will play. These are only a few of the over 100 concerts with emerging Italian music that will take place all around the country and not only on the 19th of March. 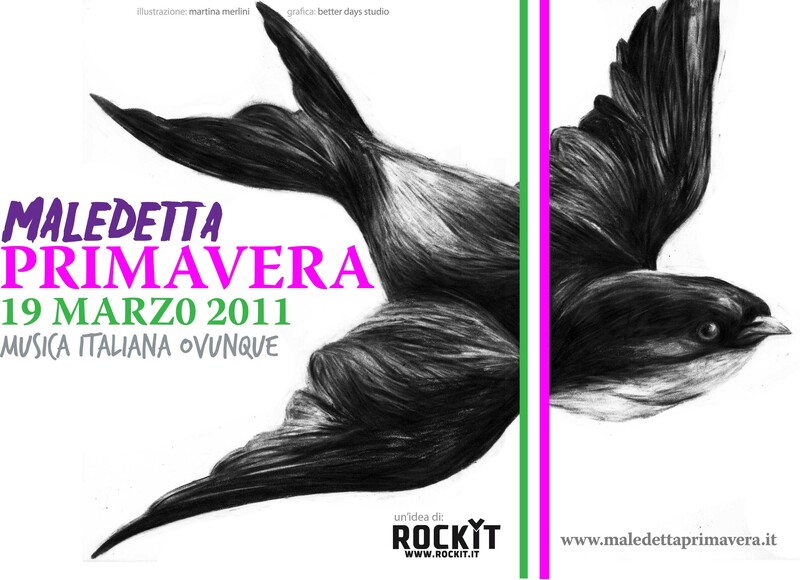 To find out the full program, check out the website and the frestyl, Facebook and Twitter pages of Maledetta Primavera. In the meantime, we’ll go to speak with the organizers of the festival and will come back with all the insights in another great bi-lingual interview. PS: For non-Italians who don’t know where the name “Maledetta Primavera” comes from I found a great self-explanatory video that you can find HERE as its creator has disabled embedding.